The US debut of Portuguese writer Saragamo: a novel written in the best classical European tradition, rich in allusions, occasionally surreal, and concerned with the human condition. Set in Lisbon, it's the story of the last year of Dr. Ricardo Reis, a man in his late 40s who has come back to Portugal to make a new life for himself. As the old year--1934--ends, Reis disembarks from the steamer that has brought him from Brazil, where he has spent the last 16 years. Unmarried, a poet as well as a doctor, Reis originally fled Portugal because of political upheaval, and a recent revolution in Brazil has in part precipitated his return. He stays first in a hotel, where he is attracted to a young woman guest who comes to Lisbon for medical treatment, and at the same time he takes the hotel maid, Lydia, as his mistress. Meanwhile, a friend and poet, recently dead, frequently accompanies Reis as he walks around Lisbon. There seems little point or purpose to Reis' life. He moves to an apartment, continues his relationship with Lydia, and asks the young hotel guest to marry him, but these seem more gestures of despair than acts of hope. Reis' politics are never really spelled out, but as the year progresses--and it is a significant year as the political situation in Europe and Portugal rapidly deteriorates--Reis finds it more difficult to remain aloof. When Lydia's brother dies in an antigovernment mutiny, Reis realizes that he can no longer be a bystander; but that admission is too much, and he goes off to join his dead friend, afraid to look back because if he does "he might let out finally his mighty howl." A compelling portrait of a man of great sensibilities and bleak vision, who, failing to escape the world in life, prefers death. 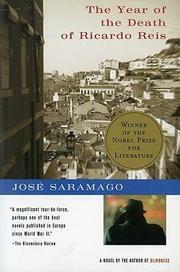 And the Lisbon of the Thirties that Saragamo describes--gray, run-down, and filled with paupers--further increases this feeling of futility and moral decay. An accomplished debut.